Creamy, fluffy, and packed with rich chocolaty flavor! 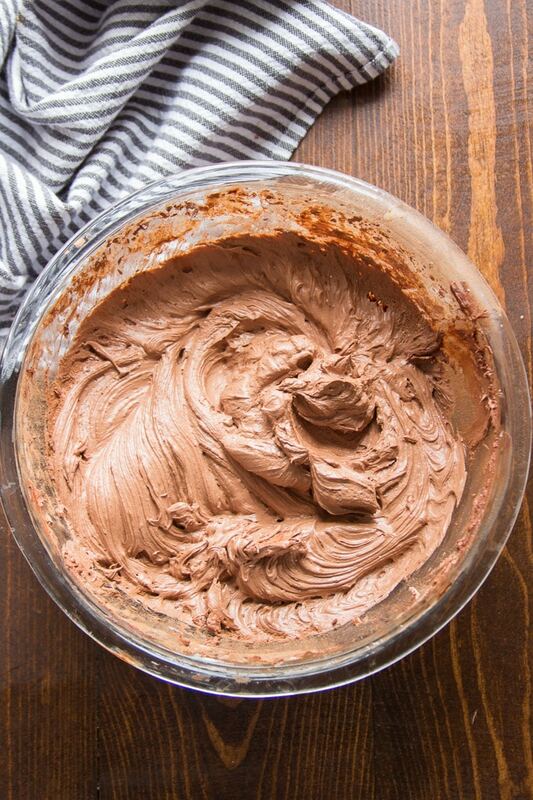 This luscious vegan chocolate frosting is exactly what you need for your next cake. Whips up in minutes and it’s freezer friendly too! You know how some people scrape the frosting off of their cake. Well, I never got that! Usually they’ll say it’s too sweet or heavy, but I suspect they’re just trying to be healthy. As someone who generally eats reasonably healthy and doesn’t have that much of a sweet tooth, I think the frosting is the best part of the cake! This is, if it’s good frosting. Sometimes the frosting on store-bought or bakery cakes tastes like shortening and sugar, and that doesn’t really do it for me. Chocolate buttercream frosting has always been my favorite, but for some reason I never bothered to make a vegan version until now, thinking it wouldn’t be as non-vegan frosting. Well guess what? 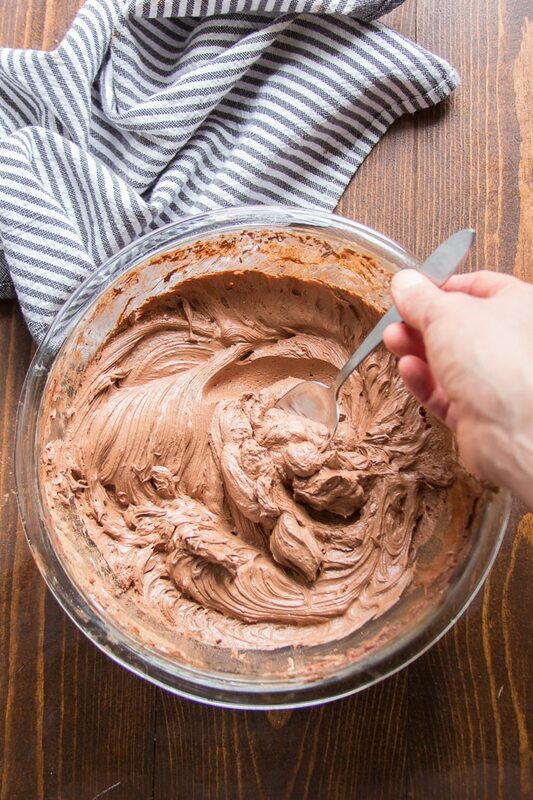 This vegan chocolate frosting tastes just like the stuff I grew up eating. 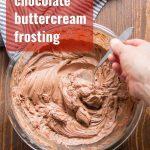 The ingredients are pretty close to what you’d use in a conventional chocolate buttercream frosting, with a few notable differences. First off, vegan butter. If you’re familiar with the stuff, you probably saw that one coming. If you’re not familiar, you’re probably wondering what it is. Vegan butter is essentially margarine, but it’s dairy free. Regular old margarine usually has some dairy additives, so it’s not vegan. 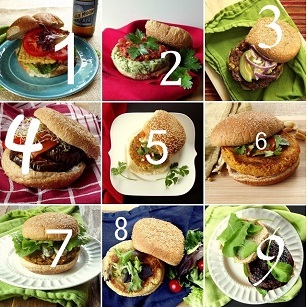 Look for products specifically labeled as “vegan.” Earth Balance, Miyoko’s, and Melt are a few popular brands. I Can’t Believe It’s Not Butter also has a vegan product. You can generally substitute vegan butter for regular butter in most recipes, but I tend to use a smidge less liquid, as vegan butter is a bit more watery than regular old butter. The other ingredient we’ll be switching up is the powdered sugar. Most refined sugar, at least in the U.S., is processed using animal bone char, so it’s not vegan. How do you find a sugar that’s vegan? Look for organic! Organic sugar is processed differently, and no animal bones are involved. You’ll also be using some non-dairy milk, and you can use just about any variety here. I like unflavored and unsweetened nut milk. The other ingredients are pretty much the same as those you’d find in regular old chocolate frosting: cocoa powder and vanilla extract. You’ll want your vegan butter at room temperature before you get started. Let it sit out for a few hours, or zap it for a few seconds (just a few!) in the microwave. Stick it in a large bowl and beat it with an electric mixer until it’s creamy. Next, beat in your non-dairy milk, vanilla, and salt. Now add the cocoa powder and start beating in the powdered sugar in batches. Continue adding powdered sugar until you’re happy with the taste and texture. Try not to eat too much out of the bowl. Save some for the cake! This recipe makes a big batch. Big enough to generously frost and stuff a two layer cake (spoiler: a recipe is on the way!). If you don’t need that much, you can cut back on the batch size, or just freeze the leftovers for later. Frosting will keep in a sealed container in the refrigerator for about 3 weeks, or in the freezer for about 3 months. Many regular supermarkets carry the ingredients you need for this recipe (vegan butter, organic sugar, and non-dairy milk). If yours doesn’t, try a place like Whole Foods. Vegan butter sometimes separates into chunks and liquid when beaten. If this happens, don’t worry about it! Just beat it until it’s relatively smooth, and proceed with the recipe. The frosting will smooth out when you begin adding powdered sugar. Creamy, fluffy, and packed with rich chocolaty flavor! 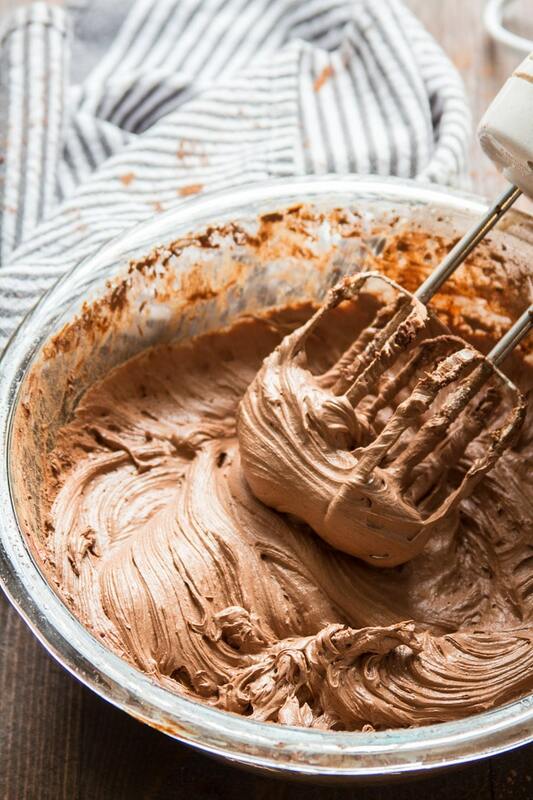 This luscious vegan chocolate frosting is exactly what you need for your next cake. Whips up in minutes and it's freezer friendly too! Place the butter into a large mixing bowl, and beat it at high-speed with an electric mixer, until creamy. Beat in the non-dairy milk, in two additions, beating each addition in fully before adding the next. Beat in the cocoa powder until fully incorporated into the mixture. Begin beating in the powdered sugar, about 1 cup at a time, scraping down the sides of the bowl as needed. Continue adding the powdered sugar until you're happy with the consistency and taste of your frosting (4-5 cups total). If you find you've added too much, thin the frosting with a tiny bit (a tablespoon or less) of non-dairy milk. Use immediately, or store in a sealed container in the refrigerator for up to 3 weeks, or in the freezer for 3 months. People are crazy scraping off that frosting! I don’t like too much, like most cupcake shops put too much of an icing mountain, but you need SOME frosting! I think it is a mix of crisco frosting and being healthy that people just jump to scraping. Because I remember either taking off frosting when I was little or just not eating cake people it was clearly a store bought sheet cake. That’s a lot of cacao powder? Is 1 cup correct? Wouldn’t just 1 tablespoon or 2 work? Chocolate is hard to get sweet generally and is very bitter plain. It is correct – this is a big batch! Plus there’s quite a bit of powdered sugar to detract from the bitterness. 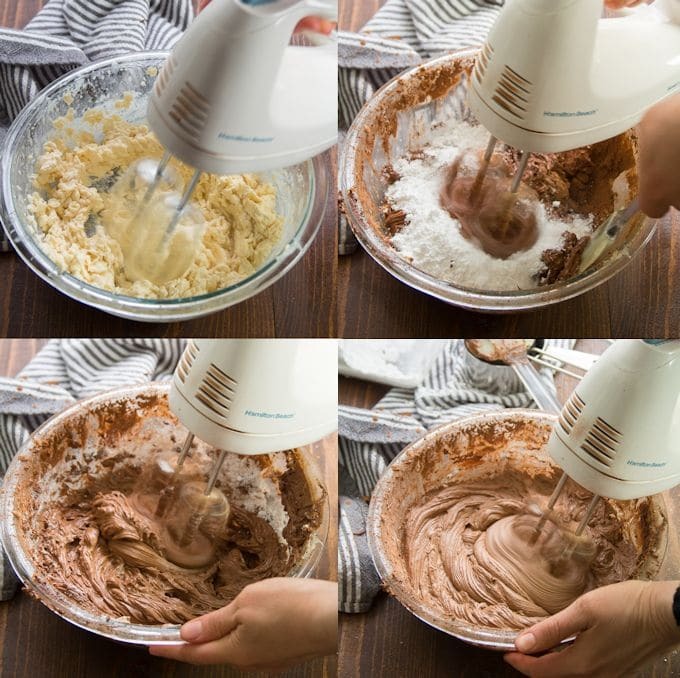 I don’t think 1 or 2 tablespoons would be enough to make the frosting very chocolaty, but you could always start there and add more towards the end of mixing. You’ll just need to alternate adding cocoa and powdered sugar to make sure you get the right balance.